The NHL’s holiday roster freeze sets in on Dec. 19, prohibiting trades, waiver transactions and minor-league demotions through Dec. 27. There are quite a few GMs who would like to shake up their rosters before the holidays. One team clearly open for business is the 28th-place St. Louis Blues, with GM Doug Armstrong reportedly saying he will listen to offers on any of his players with the exception of Jaden Schwartz and his recent top picks. 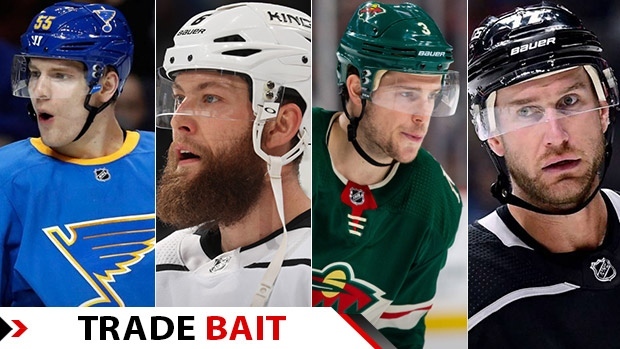 That’s why Blues defenceman Colton Parayko has risen to the top of the latest TSN Trade Bait board. A lot of the attention has been on the future of sniper Vladimir Tarasenko or (now injured) captain Alex Pietrangelo, but there are teams ready to line up to acquire a player like Parayko, who can bring back a significant return. Parayko, 25, is no stranger to the Trade Bait board. He spent time on the board last season. He checks a lot of boxes for teams as a still young, right-shooting and minute-eating defenceman with a booming shot and cost certainty for years to come. Another defenceman in Jake Muzzin follows behind Parayko at No. 2 as the 31st- place Kings try to find a way forward. Either Muzzin or the injured Alec Martinez (No. 16) are prime candidates to be part of the shakeup. Ditto Kings centre Jeff Carter, who doesn’t have a formal no-trade clause, but wields all the power to pick his next destination by way of a retirement hammer. Should Carter not be on the same page for a transaction, he could threaten to retire and saddle the Kings with a hefty cap-recapture penalty for years to come. One of Brett Pesce or Justin Faulk figures to be on the move as the Carolina Hurricanes scour the market for more scoring punch. Carolina could well find that in one of Kasperi Kapanen (the son of longtime Hurricane Sami Kapanen) or Andreas Johnsson from the Maple Leafs, with both requiring new deals this summer in their cap-strapped scheme. That’s one avenue to add an impact defenceman: trading a piece Toronto could use for a playoff run but who will ultimately be a cap casualty anyway. Speaking of cap casualty, Hurricanes forward Micheal Ferland joins the board at No. 8. He’s a power forward coming off a 21-goal season in Calgary, on pace to match that effort this year, and one trending toward a Tom Wilson-like contract. That’s too rich for Carolina’s blood.